A path to the aqua blue bay. Today is day 12 of the 24-day cruise. It's hard to believe that we're halfway through this cruise. In a few days, we'll reach Hawaii. In 15 days, we'll board the cruise to Alaska from Vancouver, British Columbia, ending in Seattle. In a mere 24 days, we'll be in Minnesota to visit our family and friends. Sunbathers and swimmers on the beach. From there, in 66 days we'll arrive in Nevada visiting more family and friends. Ninety days from today we'll be leaving the US heading for the next leg of our journey, most likely not returning to the US for two more years for another visit. With the number of people we're meeting, the over-the-top experiences we're adding to our repertoire of cruising adventures, and the sheer pleasure of spending this time together, we couldn't be having a better time. The anticipation of seeing our loved ones only adds another layer of joy to this busy and action packed period of time. The ease with which each day flows into another is barely interrupted. This morning we noticed an error or our account when charges for two drinks were listed US $17.00. Calling the guests services for an adjustment, we reached a roadblock when they explained the only way to resolve the issue was to go to deck 2 during certain hours. Passengers walking along the beach. That solution was preposterous to us. Why couldn't this be handled over the phone? But, in our usual manner of problem-solving, we addressed the issue with Jorge, our Diamond Club concierge who spends most days in the Diamond Lounge on the 14th deck. Upon entered the private Diamond Club Lounge to prepare our post for the day, within minutes Jorge had the issue resolved. We expressed our gratitude for this prompt and seamless resolution. The each at Mystery Island, Vanuatu. We seldom run across such an issue but when they arise, we look for the most uncomplicated and quick solution to avoid tainting our perception of any cruise line or ship. Diplomacy and kindness seem to get us from Point A to Point B with the least amount of stress, always our top priority. Having control over my two daily meals, breakfast and dinner, can be a challenge. On this cruise we've had the fortunate opportunity to work with Belik, head waiter in the Sapphire Dining Room. Ship passenger out for a boat ride on a small sailboat. Belik makes more effort to fulfill my dietary needs than any head waiter who's worked with us on the past 17 cruises. Having experimented with various foods within the framework of my usual diet, I've found some foods seem to exacerbate the symptoms of the past many months; mainly garlic, onions, cruciferous vegetables, and dairy. Over the past 24 hours I've entirely eliminated all dairy products including cheese which has been a staple in my way of eating over these past five and a half years. View from the ship as we sailed away from the Fijian islands. I'm hoping being dairy free will help when yesterday was my best day since the onset of the h. pylori symptoms. Perhaps now, I'll see why drinking coffee with cream only seemed to make matters worse. I blamed it on the acidity of the coffee when in fact it may have been the cream. We'll see how this goes over the next few days. Belik has been so helpful as I work my way through figuring out what I can and can't eat. There's no doubt it's added more limitations to my way of eating but, he remains determined to ensure my food is satisfactory. I've never seen anything like this guy...except, of course, Tom, who puts up with me beyond my expectations. View of Fiji from the ship. We've settled into somewhat of a delightful groove with new friends Ulla and Ray and Julie and Terry, all from New South Wales, Australia. (See the photo below). It's so easy to "hit it off" with others aboard the ship, whether couples or singles, of which there are many aboard this ship. Yesterday, we watched an wonderful movie, Collateral Beauty, well worth watching. Today, we'll head to the Palace Theatre for the 2016 movie, "Sully" which starts at 1:30 pm. As another sea day, it will be necessary to arrive at the theatre 45 minutes before showtime to ensure good seating. Our new Aussie friends, from left to right, Julie and Terry, Ray and Ulla and Tom and I. 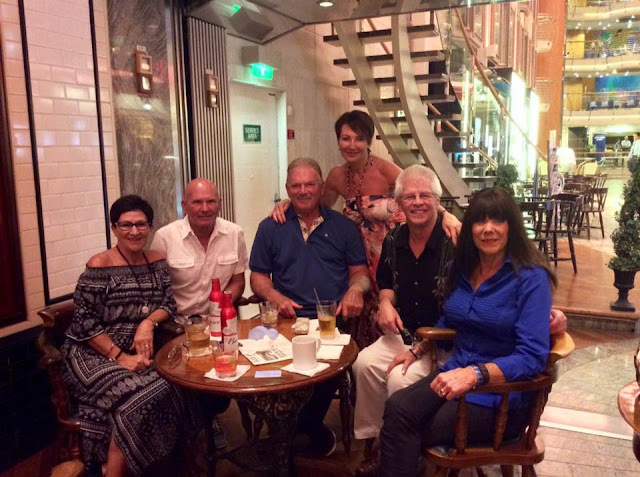 We're having a fabulous time with these two couples as we meet for happy hour and dinner most nights. After the movie, we'll mingle with other passengers in throughout the ship. By 4:15 pm, we'll return to our cabin to dress for the second formal night. As much as we dislike formal nights due our lack of dressy clothing, we make the best of it with what we have on hand, ultimately having yet another memorable evening. A sense of contentment and serenity wafts through our minds as we continue on this leg of our journey. Thank you to all of our readers for sharing it with us! The covered huts and cabana poolside at the villa in Bali, one year ago today. For more photos, please click here.